The Kings Place Festival this weekend is a three-day taster of the venue's year-round arts programme, with tickets at £4.50 (plus the odd freebie thrown in) – less than half the price of normal events. Music dominates the schedule and this is a perfect opportunity to sample styles you might have considered, but either got a bit lost in Spotify or not known where to start at all. Start here: the classical list includes pieces by Brahms, Haydn, Bartók, Debussy, Stravinsky, Schubert, Dvorák and Tchaikovsky; played by ensembles including the Sacconi Quartet, London Sinfonietta and the Academy of St Martin in the Fields Chamber Ensemble. Neither will they just play at you and leave – many of the performances include an explanation of the music. There's also folk from Ewan McLennan, Deborah Rose, Stompin' Dave Allen and the Emily Portman Trio among others, and jazz from Denys Baptiste, Josh Arcoleo, Todd Sharpville, two youth orchestras and more, as well as music and dance from around the world. The comedy and spoken word line-up is strong. Ardal O'Hanlon, Bridget Christie, Colin Hoult, Sara Pascoe and Impropera are acts you don't often get to see full shows from for less than a fiver. You can choose from several poetry performances, including the fantastic John Hegley, and authors Jonathan Coe and Simon Garfield will give talks. Discussions about politics, media and Twitter also look interesting. 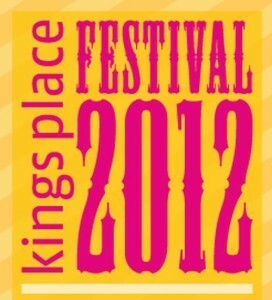 Kings Place Festival runs 14-16 September at Kings Place, York Way, N1. Tickets cost £4.50 with multi-buy discounts available. For more information see the Kings Place website.